Food/Type of allergen:Morgan et al. 1989  made water soluble shrimp extracts by separately boiling brown shrimps (Farfantepenaeus aztecus) or white shrimps (Litopenaeus setiferus) in deionized water for 15 minutes. Shrimp meat was removed from the shell, degutted and homogenized in PBS, pH 7.2 in a blender. The slurry was shaken overnight at 4°C and centrifuged at 27,500g. The supernatant was concentrated with an Amicon YM5 (cutoff >5000 Da), centrifuged at 105,000g and dialysed against PBS. Extracts were sterile filtered with a 0.45 µm membrane and were tested and found negative for hepatis B surface antigen. Protocol: (controls, definition of positive etc)Morgan et al. 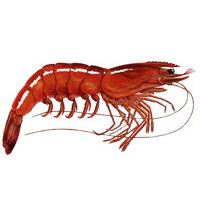 1989  defined a positive response to shrimp as a mean wheal diameter 3 mm greater than that from the PBS/glycerol (50% v/v) control with a maximum allergen concentration of 10 mg/ml. Morgan et al. 1989  used the extract of boiled brown or white shrimp described for SPT. DeWitt et al. (2004)  used recombinant Pen a 1 and natural tropomyosin from Pandalus borealis. Morgan et al. 1989  used RAST and RAST inhibition. DeWitt et al. (2004)  used immunoCAP with IgE inhibition. DeWitt et al. (2004)  tested sera from 9 shrimp sensitive subjects. DeWitt et al. (2004)  also showed specific IgE binding to recombinant Pen a 1 and seven invertebrate extracts. 6 sera bound extracts from crustacea most strongly, 2 bound dust mite extract more strongly and one serum showed similar binding with both extracts. rPen a 1 bound 94% of the IgE from the 6 crustacea specific sera and gave 50% inhibition of the binding of extracts at about 0.1 µg/ml. The natural and recombinant shrimp tropomyosin show similar binding despite the different species. Daul et al (1994)  separated proteins in an SDS-PAGE gel with 15% total acrylamide and 2.7% cross-linker. The stacking gel was 4% acrylamide. Samples were boiled in 2% SDS and 1% 2-mercaptoethanol. Reese et al. (1996)  separated proteins in an SDS-PAGE gel with 17.5% total acrylamide and 2.5% cross-linker. The stacking gel was 5% acrylamide. Daul et al (1994)  transferred proteins onto nitrocellulose membranes (0.2 µm, BA-83, Scheicher and Schull, Dassel, Germany) using a Mini Transblot tank (BioRad). Membranes were washed with PBS, blocked with PBS containing 10% fetal calf serum and 1% bovine serum albumin, washed again with PBS containing 0.02% (v/v) Tween 20 and cut into strips. Strips were incubated overnight with sera diluted 1:2 with PBS, washed 3 times with PBS-Tween and incubated with 125I-labelled goat anti-human IgE. Strips were washed in PBS and autoradiograpged for 24-96 hours at -70°C. Reese et al. (1996)  used a different method of detection with alkaline phosphatase-labelled monoclonal anti-human IgE in combination with the chemiluminescent substrate CSPD (Tropix). Musmand et al (1993)  report that IgE from sera from 13 shrimp allergic patients bound to a total of 9 bands. However, IgE from 12/13 sera bound to a band at 36-Kda. Daul et al (1994)  report that a 36-kDa allergen, named Pen a 1, reacted with 28/34 (82%) sera from shrimp-sensitive, skin test and RAST-positive, individuals. The allergen was isolated and a 21 amino acid internal peptide was sequenced which showed homology with tropomyosin. Reese et al. (1996)  report that cyanogen bromide and protease (Lys-C, Glu-C, trypsin, Arg-C and chymotrypsin) cleaved purified Pen a 1 bound IgE (and monoclonal antibodies). However, IgE was not bound by all the peptides. The IgE binding pattern was different from that of all the monoclonal antibodies. They suggest that IgE binding to Pen a 1 was localized on a limited part of the sequence. Reese et al. (1997)  showed that natural and recombinant Pen a 1 (4 clones) showed similar IgE binding to a pool of human sera. Four IgE reactive peptides, three of 13 and one of 21 amino acids, were sequenced. All were from the C-terminal region of tropomyosin and one overlapped the sequence identified by Shanti et al. (1993)  from Indian prawn. Blind:Not described for Farfantepenaeus aztecus. Number of Patients:Not described for Farfantepenaeus aztecus. Dose response:Not described for Farfantepenaeus aztecus. Symptoms:Not described for Farfantepenaeus aztecus. Daul CB, Slattery M, Reese G, Lehrer SB. Identification of the major brown shrimp (Penaeus aztecus) allergen as the muscle protein tropomyosin. Musmand JJ, Daul CB, Lehrer SB. Allergen epitopes:Ayuso et al. (2002)  used 46 overlapping synthetic 15 amino acid peptides with sera from 18 shrimp-allergic subjects to identify the IgE-binding regions of Pen a 1. 5 major IgE-binding regions were identified as residues 43-57, 85-105, 133-148, 187-202 and 247-284. In addition, 22 peptides as minor IgE-binding regions were identified. The nucleotide sequence of Pen a 1 shows 30 DNA substitutions compared to that of Met e 1, which only result in a single amino acid substitution (Reese et al, 1997 ). The tryptic peptides reported by Shanti et al. (1993)  from Fenneropenaeus indicus included 4 amino acid substitutions in 150 residues. Thus penaeoid shrimp tropomysins are likely to be immunologically almost identical. Daul et al (1994)  purified Pen a 1 from brown shrimp by SDS-PAGE. De Witt et al. (2004)  expressed recombinant Pen a 1 in E. coli. Hexahistidine-tagged rPen a 1 was purified by immobilized-metal affinity chromatography (IMAC), using nickel charged chelating Sepharose HP packed in a XK50/20 column (Amersham Biosciences) and size exclusion chromatography (SEC), using a Superdex 200 XK50/100 column (Amersham Biosciences). De Witt et al. (2004)  also purified native tropomyosin from finely chopped tail muscle of Pandalus borealis boiled for 10 min in 1 mL of distilled water per gram of tissue. After clarification by centrifugation and sequential passage through 1.2 µm and 0.45 µm mixed cellulose ester filters, the resulting extract was subjected to ultrafiltration using a PM-10 membrane (molecular mass cut-off: 10000 Da; Millipore). The retentate after ultrafiltration was applied to a Q Sepharose FF ion exchange column (Amersham Biosciences), equilibrated with 20 mM Tris-HCl, pH 8.0 and eluted with a linear 0–0.5 M NaCl gradient in the same buffer. Fractions containing strong 38 kDa band by SDS-PAGE were pooled for further purification by SEC as described above. Reese G, Schicktanz S, Lauer I, Randow S, Luttkopf D, Vogel L, Lehrer SB, Vieths S.
Structural, immunological and functional properties of natural recombinant Pen a 1, the major allergen of Brown Shrimp, Penaeus aztecus. Reese G, Viebranz J, Leong-Kee SM, Plante M, Lauer I, Randow S, Moncin MS, Ayuso R, Lehrer SB, Vieths S.
Reduced allergenic potency of VR9-1, a mutant of the major shrimp allergen Pen a 1 (tropomyosin).